Aneka Jaya Scaffolding serves scaffolding or steger rentals for Surabaya and surrounding areas. Starting from small and large scale projects. We are here to help speed up and facilitate the building of various projects you are working on with different types of scaffolding. We provide Surabaya Scaffolding Rental for renovation either on a small scale or large scale. Rental Rates Scaffolding Surabaya and surrounding areas we provide the best price, with scaffolding quality that remains maintained and safe at the time of use. Monthly and weekly scaffolding rental rates, these rental rates are the best deals for construction activists, builders who can not reach the construction medium at altitude. Consult the needs of this scaffolding tool and get a special price from us. When Scaffolding is installed properly, Scaffolding gives workers secure access to the exterior and interior of single-storey and multilevel buildings. Whether it's the responsibility of the subcontractor or the general contractor to make Scaffolding, one of the first things to consider is the design of the building and the type of work to be done. Some of the following types of Scaffolding can be used for the same type of work, so choices often come to the budget, available space around the building and how long the work will take. Frame. This scaffolding is passive and built from the ground up. This is a popular and relatively inexpensive option for long-term projects. It is used for various trades like painting and stucco. It can support many workers and equipment. It also takes a lot of space around the building, so it's not always an option for limited access places. Ladder jack. Scaffolding ladder jacks are built using two metal devices which when mounted onto a ladder make a stable foundation for the platform. This is a quick and easy solution, but it is only suitable for light work such as maintenance or setting no higher than stairs. It is not designed to support the load of some crew members or heavy equipment. Pump jack. This scaffolding is supported by moving brackets on vertical poles. It's easy to adjust, like a car jack, and will work well for siding and small painting jobs or other tasks that require work at variable heights. Mobile or rolling. This scaffolding is arranged on the caster, so it can be moved easily to other parts of the job, assuming you have a flat surface to roll it. This is ideal for exterior and interior completion where contractors need to expand horizontal access along the surface. Suspended scaffolding consists of platforms with a guardrail system that can be raised up and down with a rope connected to an electric motor positioned on the roof. Scaffolding is a good choice when work is located on the upper floors of the building exterior or when the building is very high so that the installation of the scaffold frame is not practical. 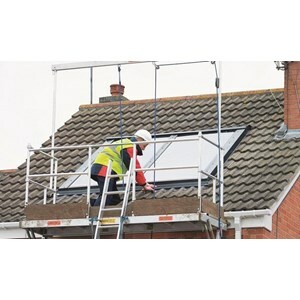 Window cleaning, repairs and other maintenance contractors will use this type of Scaffolding. No matter the type of Scaffolding, the contractor must follow all safety rules and Occupational Safety and Health guidelines for assembly and use.